I’ll start with the most petty and irrelevant reasons. I have a serious repellent reflex towards Catalans. This is largely because I love Spain so much, and their anti-Spanishness really gets my goat. I find their Gallic delusions that they’re so much more European and Mediterranean and civilized than the rest of Spain to be insufferable. (And some day I’ll get around to dismantling the cult of “Mediterranean-ness” itself that’s grown since the 1980s and that I find a completely false and fabricated pop-multi-culti identity that grew out of tourist literature, the public relations campaigns of olive oil companies and a popular sprinking of Braudel, and nothing else. When even Turks start acting and feeling like they’re “Mediterraneans,” you know that a discourse is b.s. and needs to be taken apart; the extremeness of the hype surrounding Barcelona is part of this, and is why I love the gravitas and even crudeness of Madrid and Castille so much more deeply.) I find Catalans’ noli me tangere squeamishness about how they shouldn’t have to suffer by being a part of this barbaric country of monarcho-fascists and Catholics and gypsies and bull-torturers to be racist pure and simple. They’re Iberian Croatians, in short. There are plenty out there who will get the analogy, I believe. But none of that has any real bearing here. 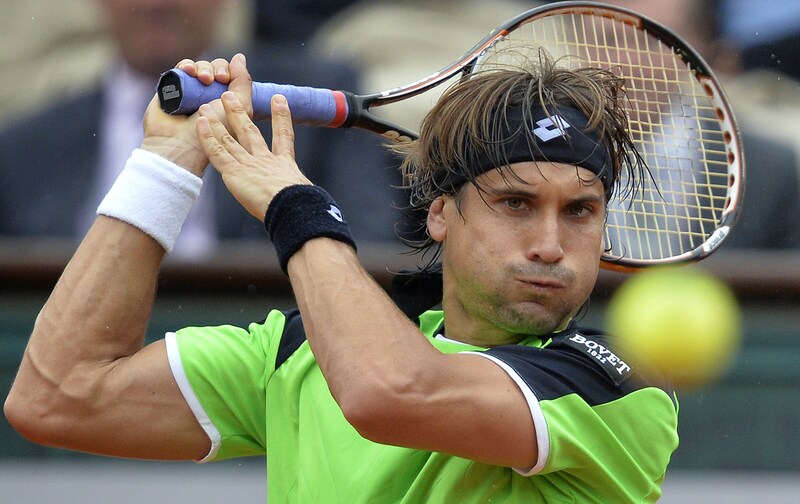 And poor Rafa shouldn’t have to be the object of my scorn just because he’s Catalan; Ferrer is too and I think he’s one of the most compelling and wonderful to watch tennis players out there. I simply hate watching Rafael Nadal win because he’s ugly. And by ugly I don’t mean short and mousey-looking or that his thinning hair is always already a greasy mess from before the match has even started. I mean ugly with a lack of that kind of inner force that manifests itself as a visible form of athletic charisma and magic. Since the beginning of institutional athletics in human civilization, meaning the Greeks, of course, we’ve always expected our athletes to partake of “some part of beauty.” To have something that made us feel, even if just partly, that a god were being incarnated here in this man, in our presence. “En-thusiasm” in English comes from the Greek ενθούς, ‘possessed by a god, inspired.” Whether it’s the gorgeous dance of a great basketball or tennis player, or the weightlessness and super-human strength of a gymnast, or the painful duet of two wrestlers or martial artists of any kind, or just the sublime bulk of a rugby player or Olympic weightlifter, or the highly choreographed beauty of a good American football game (yes, it’s a beautiful, highly choreographed, strategically intricate game, much more compelling than…wait…let me swallow first…soccer), we need to experience this glow, which is not a conventional handsomeness or prettiness that I’m talking about, but the need to sense this power and this powerful yearning for glory and victory emanating out of this being, who we want to feel is slightly more just-above-human than the rest of us are. You never feel any of that glow emanating from Rafael Nadal. It’s just the same cold, technically precise game and the same cold, pissy look on his mug: the most emotion we’re treated to is if things start going a little badly and the pissy mug just gets a little pissier. After the match, if you mute your set and if the score box isn’t showing on the bottom, you almost can’t tell if he’s won or lost. Just the same cold shaking of hands and greasy slinking off of the court. Compare this to the elegant gentlemanliness of a Federer. Or the brute, Rodrigo Díaz de Vivar, clanking mediaeval long-swords game of a Valencian muscle-brick like Ferrer (above). Or the young, beautifully British, sportsmanly hunger of Murray. And then there’s my dear, sweet Nole, of course, who in every endearing way is still a teenager of sorts, and may have the purest soul of any professional athlete out there. (Talk about “the tenderness of the warrior.”) No matter what his rank or seed are, or how well his season has been going, he’s as desperately trying to keep his nervousness under control before a match as a young volunteer going into combat for his first engagement, because I think that that’s what he genuinely feels in his heart each time. And when things go badly, and he tragically can’t stop them from going even more badly, because, like an adolescent, he beats up on himself mercilessly because he feels like he’s failed to prove himself, failed to earn his “red badge,” he inspires the purest Aristotelian feelings of pity in me. * And yet, his dignity in defeat is always impeccable. And his howling glory in victory is all his own too. Lots of people don’t like that or feel it unsportsman-like. Trust me, Olympia was a scene of howling winners just like him – and probably then some. 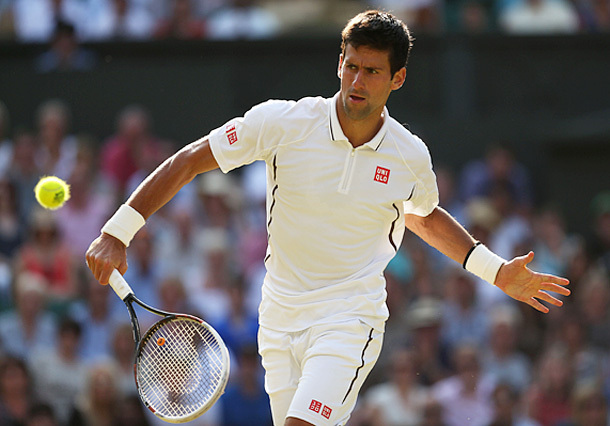 Finally, the spectacular grace of Nole’s feel for his own body is unmatched by anyone in the sport. Almost like a bullfighter, you sometimes feel he’s risking an easy point just for the gracia and and pure elegance of a braver, more dramatic play. 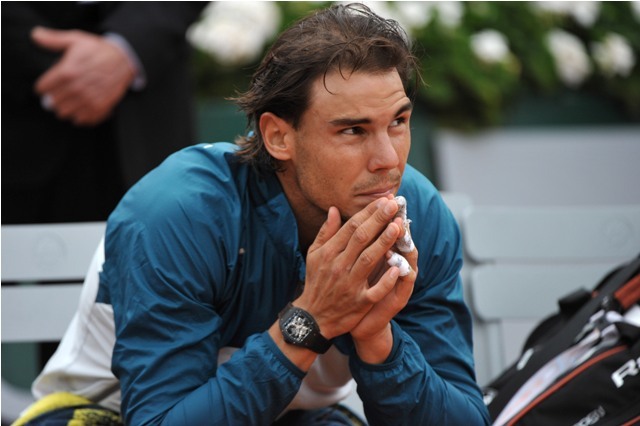 You feel no sense of any of that pathos or agon in Nadal’s game. None. So when Djoković loses to a man like Federer, or Ferrer – which I don’t think he ever has – or even Murray, I say helal olsun,** να’ν καλά ο άνθρωπος, he deserved it. And I don’t walk around with this churning feeling in my stomach for days afterwards. Effing Greeks had said everything, hadn’t they? Everything else is a footnote.